Whether it was a Ginsu knife, George Foreman Grill, Tony Robbins' motivational book, kitchen device by Ron Popeil, or any of the countless other famous products that have been marketed on infomercials over the years, you or someone you know has bought one—and you're not alone. Last year, one out of every three Americans picked up the phone and ordered a product from a television infomercial or home shopping network, and in "But Wait . . . There's More!" 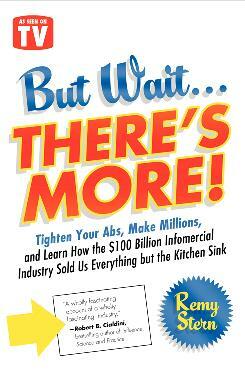 journalist (and infomercial addict) Remy Stern offers a lively, behind-the-scenes exploration of this enormous business—one that markets the world's most outrageous products using the most outrageous tactics. Don't let the kitschy exterior fool you: behind the laughable demonstrations, goofy grins, and cheesy dialogue lies an industry larger than the film and music industries combined. This may be the first book to expose the never-before-told story of the infomercial and home shopping phenomenon in all its meteoric rise to become one of the most profitable businesses in America. Along the way, Stern details the history behind the classic products and introduces readers to some of the most famous (and infamous) pitchmen and personalities in the business, including Tony Robbins, Billy Mays, Ron Popeil, Tony Little, Suzanne Somers, Kevin Trudeau, and Joe Francis. He also presents an in-depth look at the business behind the camera—the sales strategies, psychological tools, and occasionally questionable tactics marketers have used to get us to open up our wallets and spend, spend, spend. Stern's account also offers a look at how late-night television conquered the American consumer and provides insight into modern American culture: our rampant consumerism, our desire for instant riches, and our collective dream of perfect abs, unblemished skin, and gleaming white teeth. Both a compelling business story and a thoroughly entertaining piece of investigative journalism (with a touch of muckraking and social satire), this story will ensure that you never look at those too-good-to-be-true deals the same way again.